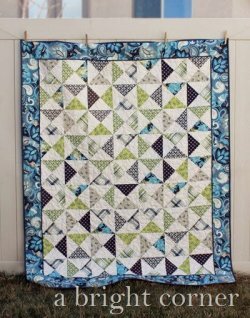 Andy used fat quarters to create half-square triangles that made up this block. You can adapt the pattern to create a quilt of whichever size works for you. Andy used some Riley Blake fabrics, but you can, of course, use whichever fabrics you love! Bonus! You can find the pattern to go with this quilt here.